Snail Bob has been a frequent and welcome visitor to these pages. He’s the star of a series of PC-based desktop games that puts the clever critter into a variety of challenging situations. 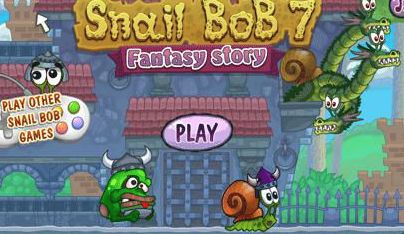 Snail Bob 7 finds our hero in a fantasy dream world populated by menagerie of fantasy monsters. To survive, Snail Bob relies on a player’s puzzle-solving skills to work his way through multiple levels. He encounters dragons, castles, invisible doors and other challenges. Some levels include teleports that will help players avoid enemies and complete the level much faster. Like other versions in the Snail Bob series, Snail Bob 7 is played a desktop computer with a mouse to control Bob’s movements. That makes it easier for children or older adults who might have trouble mastering the complicated controllers for platform games. All of the Snail Bob games can be played for free at the Snail Bob 7 website.